There are two Seattle's Best Coffees in Orange County which are just must-visit gems. They're lovely stores, with friendly employees, and you'll get a fantastic beverage. Interestingly, both are operated by the same franchise owner. I'd previously found a rather ordinary Seattle's Best Coffee in Garden Grove (also Orange County, California), and so it made it all the more delightful to find the two gems of stores - one in Irvine, and the other in Lake Forest. When I walked into this store, the first thing that struck me was that they're using a La Marzocco espresso machine for their espresso beverages! Of course, I immediately asked about. I met some amazingly enthusiastic baristas who said that this Seattle's Best franchise has been operating since the 1990s. When the franchise owner originally opened up this SBC franchise, the La Marzocco was standard, and at this point, they're "grandfathered" in to have this machine. New Seattle's Best Coffee franchises must have standard SBC-issued equipment, meaning automatic espresso machines. Isn't that a thing of beauty? By the way, my latte came with a heart on it - no lid, and latte art. I talked briefly to one barista who was heading out the door, who said she'd been at this store for seven years. This franchisee must really know what he is doing! This store was fairly busy, but just so you know, there is both indoor and outdoor seating, Seattle's Best Coffee for at-home use available to purchase, merchandise, and some nice goodies in the pastry case. Just a few more pictures of this great store - I hope you get a chance to visit! This is a fairly new store. 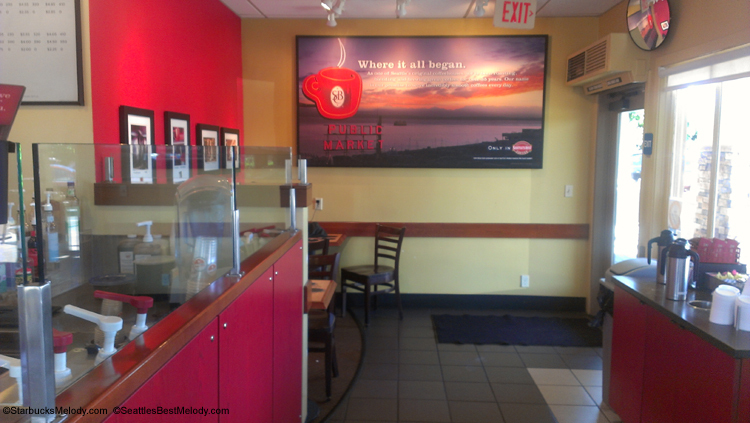 I found an online site which indicated the grand opening was May 1, 2012, for this Lake Forest Seattle's Best Coffee. As I already mentioned, both of these locations are operated by was franchisee. I met the store manager, Jennifer, who definitely loved her store, and readily answered my questions. It's a cute location, with plenty of indoor and outdoor seating. I noticed some really delicious looking treats in the pastry case, and Jennifer opined that her store had a special arrangement to get some special bakery goodies in. My carrot cake and coffee were delicious. Take a look at this store! I had such a good time during this visit. I surprise myself, but I somewhat adore what Starbucks is doing with the new business model for Seattle's Best Coffee. On this visit, I met the store manager, Valerie Floyd, a 9-year Starbucks partner. She was super excited about the SBC drive-thru experience, and said that she'd recently returned from a trip to Dallas to open up about ten stores down there. She began her career many years ago, and then switched to the Seattle's Best side. She had been a manager of a now-closed SBC cafes in downtown Seattle. I got a customer voice receipt this visit, and Valerie got me started on a punch card too! 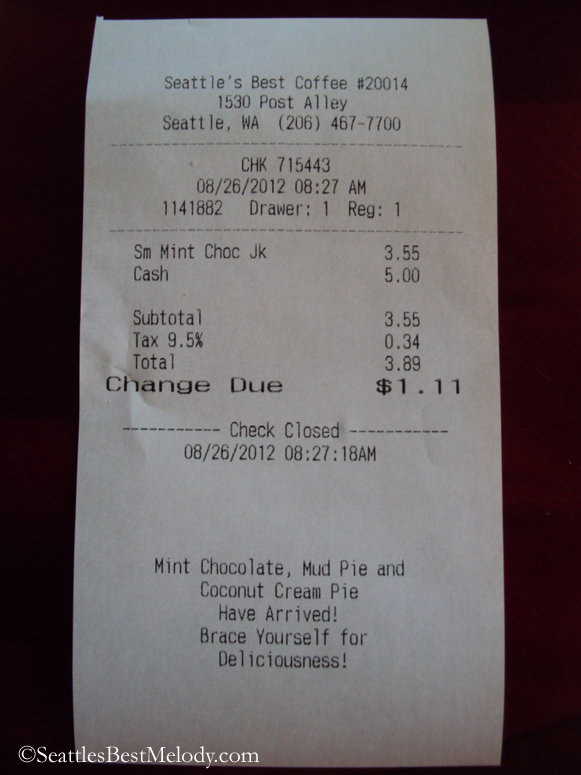 I didn't realize it, but Seattle's Best Coffee has Customer Voice receipts just like the Starbucks ones! 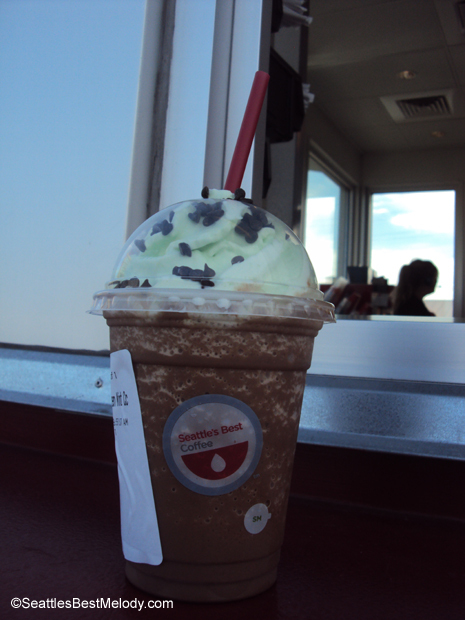 Try the Mint Chocolate Chip Mocha! Much later in the same day, I test drove a new Honda Fit at the Honda of Fife dealership, in Fife, Washington. I am kind of in the market for a new car, though I don't know if that will really happen or not. 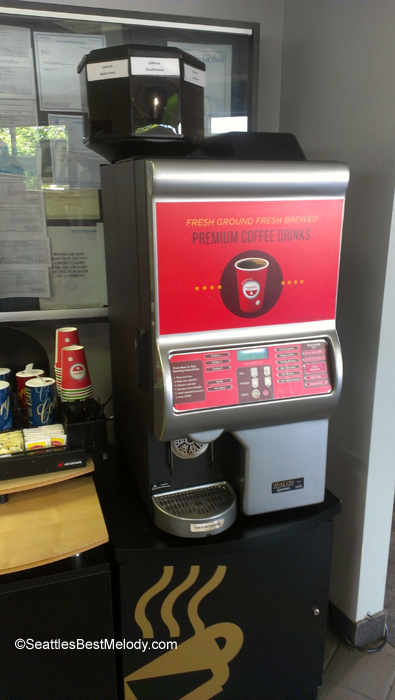 While I was at the dealership, I walked past an auto-Seattle's Best Coffee machine in their lobby! I immediately grabbed my cell phone to take a few photos of it, and the saleswoman looked at my very strangely. I tried to explain that I have a blog about Starbucks, but still she seemed to think it was odd that I was taking a photo of the lobby coffee machine. I didn't get a chance to try it! I asked her how long she's had it, and she said that it's been there for a couple of months. Interesting machine! I think it would be a better option for something like just basic coffee. 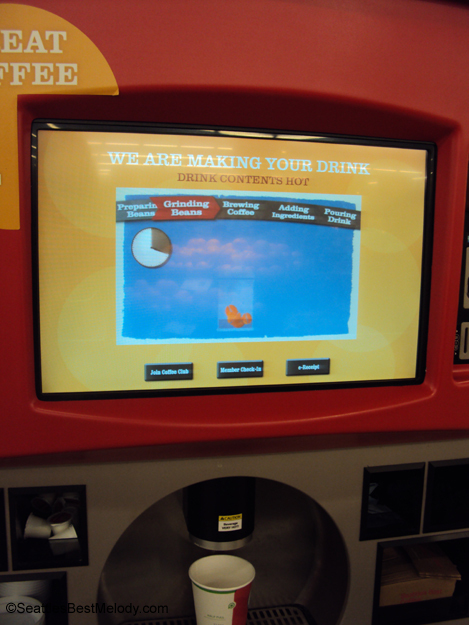 I will say that the display screens will do a great job of keeping you entertained as your beverage is being made! 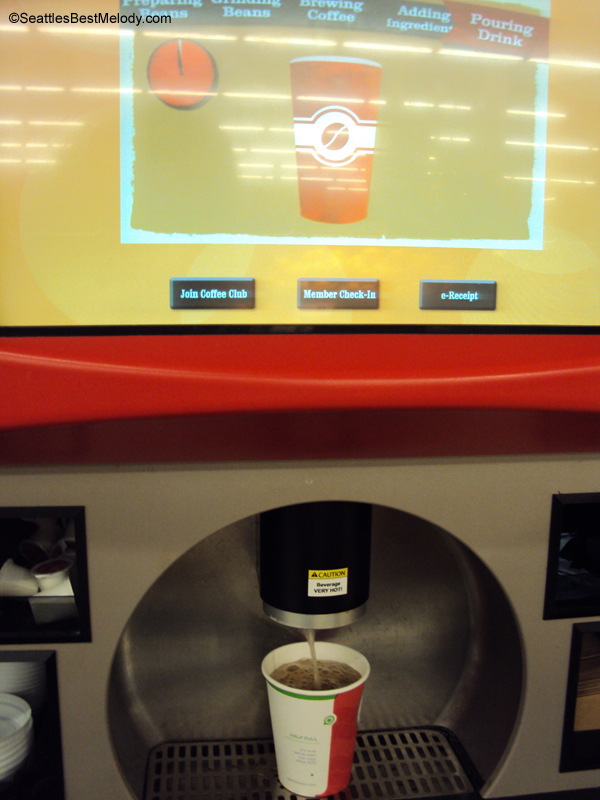 The screen changes often, telling you exactly what the machine is doing. And, you can pay with cash or with a card. The jury is still deliberating on this machine! I am going to try and find another one, and try a few more of the products from it. The 'mint mocha,' though, is not recommended. I'd love to know if you have tried these too! I will report back on this again some time! 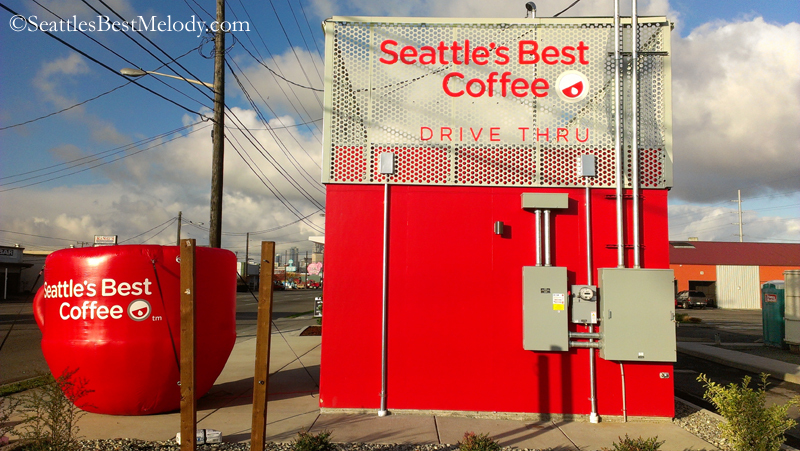 Seattle's Best Coffee (a subsidiary of Starbucks /fully operated by Starbucks) is launching little tiny drive-thru only stores all over the country. I understand that there will be about 300 of them, from what I have heard - look for one near you! Before I go any further, I want to say that I had BLAST experiencing this. A total blast. I write this article sitting at home, smiling. Today is Saturday, and I was out with a good friend, and we were returning home to Seattle from something we'd both just been to in West Seattle. My friend was driving her car. This is an important little piece of information because normally, I don't get to go through drive-thrus at all. At the moment, I don't have access to a car, and I haven't for the past couple of months. And even before that, because of some mechanical problems with my old car, I would not use a drive-thru. So this was a special occasion for me: It's the first time I've been through a drive-thru in quite a while. 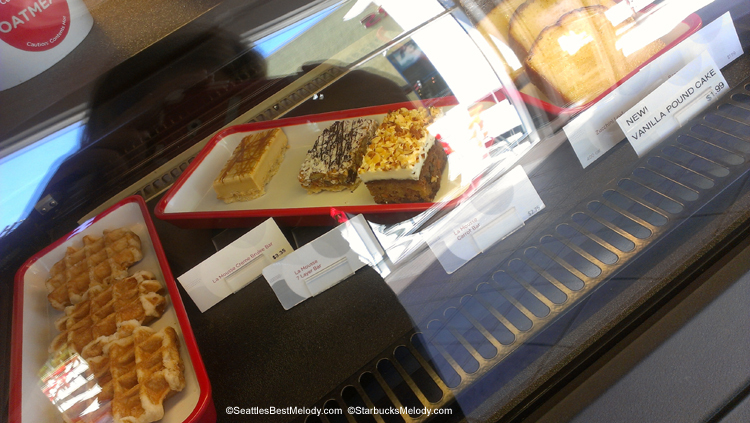 My last drive-thru experience might have been the shipping container Starbucks which opened in December 2011. And I think I may have only used the walk up window during my visit to the shipping container store. In fact, I'd previously planned to take the Link Light Rail to the SODO station and walk to the new Seattle's Best Coffee drive thru, but this was much more of a treat to experience this spontaneously with a friend in a car. By the way, this SBC drive thru is so close to the Starbucks Support Center (Starbucks calls their headquarters the "SSC," which stands for the "Starbucks Support Center.") that you could see the top of the Siren peaking out at us. (It's most obvious in the very first photo in this article). Then the two of us went through the drive thru. My friend and I both ordered vegetable pockets. They were pretty good. 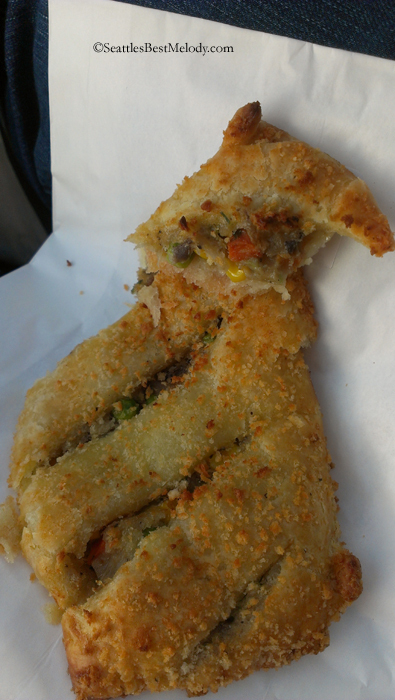 My friend thought the inside texture was a bit too 'doughy' for her, but there were still good. 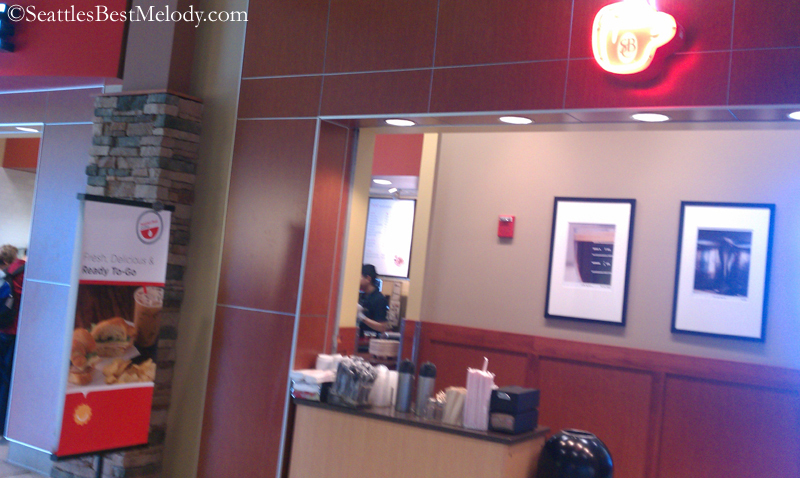 When I was at the walk up window, I did inquire about the breakfast sandwiches. For a long time, SBC has offered a very nice basic egg and cheese sandwich that I like much better than the Starbucks breakfast sandwiches. It somehow tastes fresher. Those are still available. There is a variety of food and drink items available. The guy working the drive-thru appeared to be having a blast. I snapped a cute photo when my friend leaned forward to grab some money! If you want to visit this little Seattle's Best Coffee, the address is 2990 Fourth Avenue South, Seattle, Washington, 98134. This store's grand opening was November 14, 2012. I realize this little Seattle's Best Coffee blog is very quiet! Please leave me a comment and "like" the blog! Follow the link to request that a sample of coffee be mailed to you - it's a small sample of Level 3 coffee. 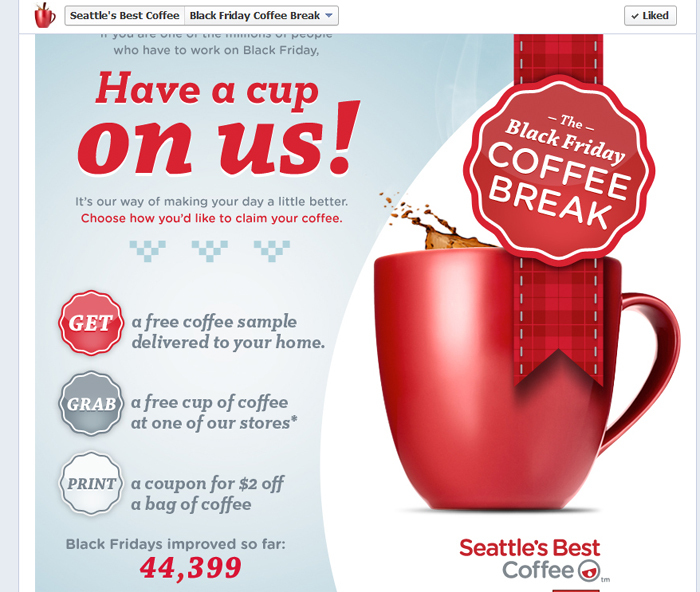 Go to a Seattle's Best store on the day after Thanksgiving, and receive a free 12-ounce brewed coffee. If you click on this one, it will give you a directory of Seattle's Best stores everywhere - a very handy list! Print a coupon for $2.00 off your next purchase of whole bean coffee at your local grocery. Since there have to be at least a few readers out there who want to save a little bit on their coffee, I thought I would pass this along. 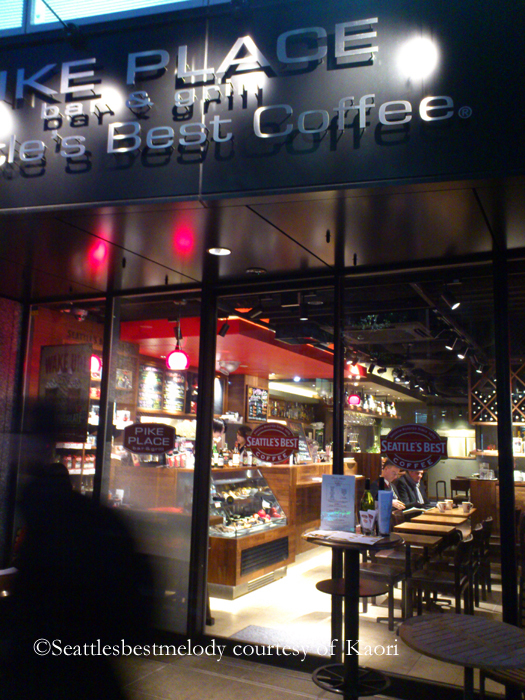 For me, I will be dropping by my neighborhood Seattle's Best in downtown Seattle, and enjoying free brewed coffee. I have a little story to tell. Some of you might remember that I mentioned that I did an afternoon of volunteering with Food Lifeline back in July. Actually, I volunteered again at Food Lifeline in August, and I'm scheduled again in September. I mentioned the July volunteering briefly in this blog article here about the Seattle's Best Red Truck. I was with my good friend Abbey. She is wonderful. As I was hurrying to take photos of the Seattle's Best Red Truck, Abbey was standing around drinking the little sample beverages that Seattle's Best people were passing out. Honestly, I was so preoccupied with taking pictures, that I don't think I actually drank anything. The big Red Seattle's Best Truck baristas were sampling the "Mint Chocolate JavaKula." And then later, I was out with Abbey and other friends again for our regular Friday lunch routine. We often drop by Collins for lunch on Fridays. From there, it's a very short walk to the Seattle's Best Coffee located on the corner of 2nd and Cherry in Seattle's Pioneer Square neighborhood. As we left Collins, Abbey turned to me (and the other friend with us) and said, "Can we go to Seattle's Best now? There is something I want to get." Of course, we said, "Sounds Good!" Abbey ordered a Mint Chocolate Java Kula. I ordered the same thing. I figured that if Abbey was this enticed by it, I would be too. Holy Moly. That is good. Holy Moly. I think I like it better than any Frappuccino that I've ever had. Mint whip cream pretty much will curl your toes. That is delicious. It's not too heavy, and just the right amount of chocolately-ness, and it's 100% delicious. Abbey explained to me that she discovered it when were visiting the Seattle's Best Red Truck, and she knew she had to have it again. Get yourself to Seattle's Best! I decided that I had to try this beverage yet again to see if it really was so very very very very yummy. I dropped by the Seattle's Best Coffee location in Post Alley (inside Pike Place Market) and YES, it was just as good again. By the way, it seems like a JavaKula is a little cheaper than a Frappuccino too, which is a very nice added bonus. 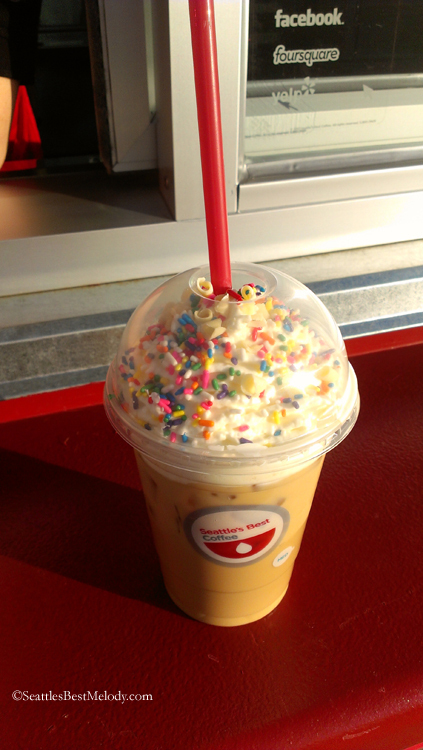 I may go get one again today! That's my little Mint Chocolate JavaKula story. Thank you for reading it! And if you do visit Seattle, be sure to visit the pretty Seattle's Best in Post Alley. When I started this blog about 9 months ago, the very first photo uploaded with the Seattle's Best Coffee store at Post Alley, closed in the winter with snow around it. It's still a beautiful picture to see! Last but not least, be sure that you are following Seattle's Best Coffee on Twitter, and they have an official Facebook page too. Please "like" this little blog! There is a Seattle's Best Coffee at SeaTac Airport! There is a Seattle's Best Coffee at SeaTac Airport! I had been meaning to mention this for quite some time, and I thought I'd share a few photos. 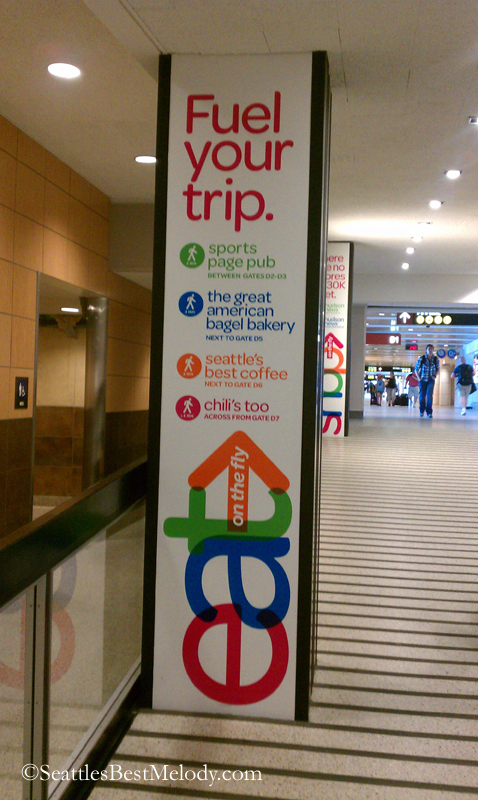 You'll know just what and where to look for, if you want to try the Seattle's Best at SeaTac. There are a few convenient signs here and there indicating that the Seattle's Best is in the D Concourse. There is a long hallway of seating adjacent to the register area of this store. One nice thing is that you'll probably be able to find a place to sit. Above the tables hang a variety of pictures. Somehow, my one favorite is of the guy opening his cabinet and finding all coffee cups. I can relate to that! I tried the iced caramel coffee on my visit to Seattle's Best. It was definitely good. I like SBC iced coffee, as it is prepared with a cold brew method. However, somehow the drink seemed a little sweeter than what I am used to. I don't know if the SBC beverage recipes call for more pumps of syrup/ sauce than their Starbucks counterparts. 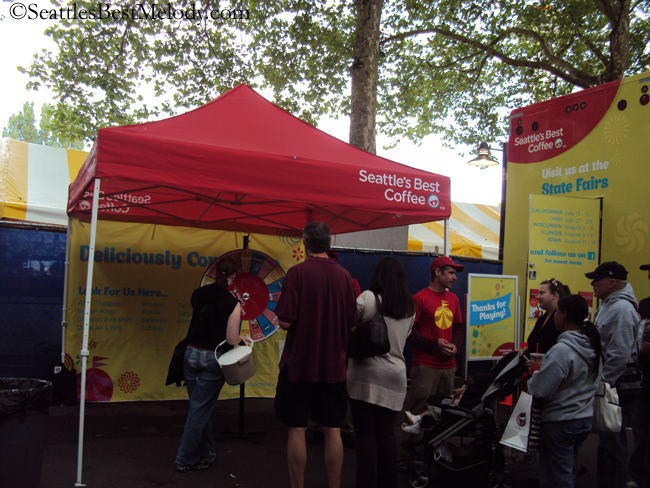 The Seattle's Best Coffee Red Cup Showdown Truck stops by the Bite of Seattle! Today (July 20, 2012), I was at the Bite of Seattle with two colleagues, and I stumbled upon the Seattle's Best Red Cup Showdown truck! It turns out it was just there for one day only, passing through on its way to Ohio. I was disappointed that the truck wouldn't be there for the weekend, but apparently they have to get on the road, to get to the Ohio State Fair next. I was actually at the Bite of Seattle to participate in a Food Lifeline event, which is a fundraiser in partnership with Tom Douglas to raise money for Food Lifeline. My friends and I were leave the Bite of Seattle, and there it was! A HUGE Seattle's Best truck! People in red Seattle's Best polo shirts and caps were giving out sample bags of Level 3 coffee, and there were sample cups of iced caramel lattes, and some kind of mint mocha drink too. And there was a prize wheel that you could spin too. Prizes included coupons, Seattle's Best gift cards and more. The prize wheel looked like a lot of fun but there was quite a line for it, so I didn't get a chance to spin it. I did manage to snap a few photos of the big Seattle's Best Red Cup Showdown truck, and it's definitely worth sharing the pics here! I hope you get the chance to run into Red Cup Showdown truck! This was definitely good luck on my part, and I got a kick out of seeing it up close and personal. You can follow Seattle's Best Coffee on Twitter too. Starbucks newsroom announcement regarding Seattle's Best drive thrus. This blog is a very quiet blog compared to my other blog, but by chance do I have any readers who have gone to visit this store? (and who could send me more photos?) By the way, it does not appear that this new store in on the Seattle's Best store locator yet, but if I get more photos, and an exact address, I will post those at a later date. 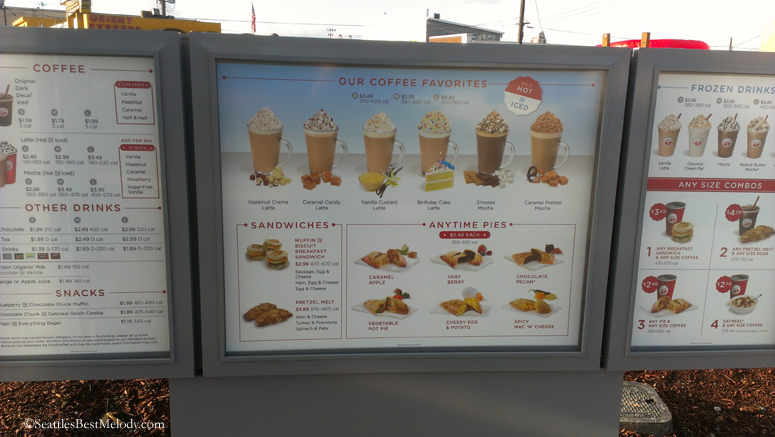 What do you think of the new concept drive thru store? I was recently visiting a friend, and when glancing at her shelf of coffee mugs I noticed three Seattle Best Coffee items: Two coffee mugs and a shot glass for espresso. I had my phone with me, and took a few quick photos because I thought it would be nice share them here. I especially think the shot glass is charming. Of course, all these items have the old Seattle's Best logo, but I can't date when they would have been in stores. I couldn't find any kind of date on any of these glasses. Have you ever seen these before? Have a look at these old mugs! I thought it would be fun to point out these two things here on this site. I wouldn't mind seeing a few other fun merchandise items at the Coffee Gear store. It might be fun to see a playful t-shirt with the Seattle's Best Levels on them, or coasters with the SBC logo. If you want to read the longer article that I wrote for my other blog, click here. I'm not sure entirely what the Pike Place Bar and Grill is - I'm not familiar with that restaurant. But in any case, if you're in Tokyo, now you know where to go to find a Seattle's Best! Here are the pictures. Enjoy! Some day, I hope to visit Tokyo. Seattle's Best has something that I really like: it's an iced coffee made with a cold brew method. If you're in a Seattle's Best cafe, this is not to be missed. Cold brew coffee brewing produces an incredibly sweet, low acidity, smooth, fabulous iced coffee. It is amazing. It's just on their menu board as "iced coffee," so unless you ask (or already know) you might not know that it is produced by a cold brew. The coffee they use is a special blend called, "Saturday's Blend" though unfortunately, I don't know very many details about that coffee. I've heard it is a medium to dark roast, and in the past (before the switch to the level system) it was often promoted as their summer coffee. I'm no SBC expert, so if hopefully if I haven't got this right, someone will say so in the comments. I realize that it's painful to write about Seattle's Best products that many folks will never get a chance to try. There are so few Seattle's Best cafes. There used to be more but when Border's Books went out of business, Seattle's Best lost a significant number of their cafes because so many of their cafes were inside those stores. I was browsing the Seattle's Best store locator attempting to figure out where there are Seattle's Best cafes, and I wonder if there is fewer than 100 in the entire country. There are four Seattle's Best in downtown Seattle. There used to be two more. The Starbucks at First and Pike was once a Seattle's Best coffeehouse, taken out by Starbucks. And the Starbucks at Westlake Center was once a Seattle's Best (that I definitely remember! 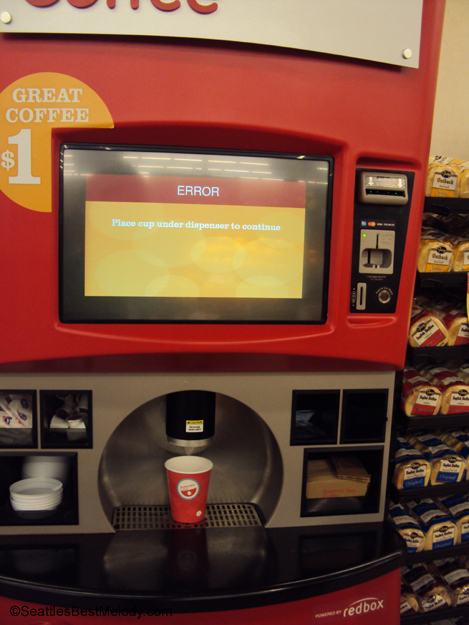 ), and was also ousted by the parent company, Starbucks. I am sure that there is a Seattle's Best Coffee at Sea Tac airport, and a Seattle's Best barista today told me that there is one in Renton. All I can say, is be on the look out for them. I've heard that Portland has one, Los Angeles, and NYC. Keep your eye for them! Back to the topic of cold brew: From what I know, the coffee is ground as a rough or course grind, and then is basically soaked for a full 24 hours as the brew method. There definitely are home versions of this brew method, though I have not experimented with it. I know that very briefly that the Starbucks that was once called "15th Avenue Coffee and Tea" experimented with Starbucks Kenya as a cold brew. I had this, and I loved it. Kenya makes a fabulous cold brew. So today, (1-22-12) I dropped by the Seattle's Best Coffee on the corner of 5th and Pike in Seattle, and I indulged in the cold brew coffee, despite that it was raining out, and bought a cute mug too. By the way, they sell a vanilla flavored version of the cold brew, and it too is fabulous. I had had my eye on this mug for a while, and so I included a photo of it taken this past summer which I think shows off its charm.